Twin Falls Chalet is a privately operated backcountry lodge, located at the head of the Yoho Valley in Yoho National Park, in Western Canada. It is only accessible by foot and can accommodate up to 14 overnight guests who hike in from various hiking trails in the area. Afternoon tea and freshly made bakeries are also served, for a fee, to day hikers who stop in for a rest. 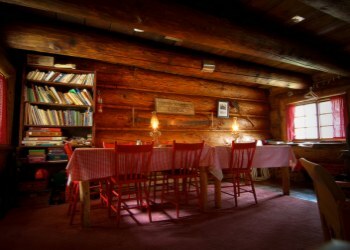 Twin Falls Chalet has the rustic warmth and comfort reminiscent of Canadian heritage. The two-storey main lodge houses the dining area and living room on the first floor. There are 4 sleeping rooms on the second floor. The two front rooms offer a view of Twin Falls and can each accommodate 4 persons, in single two-level bunk beds. The two back rooms can each accommodate 3 persons. All rooms are equipped with blankets, sheets and Black�s Icelandic sleeping bags, towels, soap and wash basins. Battery powered night lamps and flashlights are supplied. There is no running water and the outhouse is located approximately 50 meters from the main lodge. Rates are $250.00 Canadian dollars per person per day. The Tea House was operated by the CPR on a leasehold basis through the 1920s, '30s and '40s. In 1953 it was closed, as the rail tourism business declined in favor of automobile-borne tourism. In 1954 the Tea House and other CPR properties were sold to Brewster and Ford Mountain Lodges Ltd., who reopened the Tea House in 1959. In 1969, when the National Parks services started closing down and tearing down backcountry shelters and warden cabins, they proposed the demolition of the Tea House, citing poor repair and the absence of utilities. This prompted Fran Drummond to start a long but victorious battle with the Canadian Government. Now, Twin Falls Chalet is a national historical site known as �Twin Falls Tea House National Historic Site of Canada�; dedicating plaques were installed by Parks Canada at the site in 2006. Most of the hiking trails in the area were constructed by the CPR and it�s Swiss Guides in the early 1900�s. As well, many of the mountains, lakes and streams bear the name of CPR officials: Marpole Lake1, Mount Kerr2, Lake Duchesnay3. In 1906, the Alpine Club of Canada named two mountains in the area the �President�and the �Vice-President�. CPR can also take some credit for the founding of Yoho Park. In 1901, then Secretary of the CPR Charles Drinkwater suggested that the Yoho Valley be made a national park to expand the recently created Mt. Stephen Park Reserve. 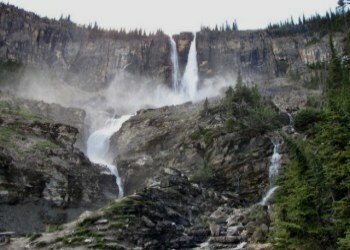 By 1911, fourteen of the twenty park�s hiking trail had been built by the CPR, including the Yoho Valley Trail in 1901, leading to Twin Falls. Yoho National Park was originally established in 1886, first comprised of 10 square miles in the area of the Burgess Shale; it was enlarged several times and now totals over 500 square miles. The Park lies entirely within the Province of British Columbia; the Continental Divide and Banff National Park form its eastern boundary. From Twin Falls Chalet and its surroundings, visitors can admire the double cascading effect of Twin Falls. Twin Falls Creek is forced in two by a large block, and then shot over a massive cathedral Limestone cliff, plunging almost 600 feet before cascading down a narrow gorge. There are recorded accounts of trail workers employed by the CPR using dynamite in 1924 in an (unsuccessful) attempt to make the two falls equal in volume. The south fall is usually of lower volume because of a sharp bend in the creek above the falls where debris impede the flow.